Metamorphism occurs as the result of heat. Temperature (T) = 200°C - 850°C. The upper T limit is…melting (which would make it an igneous rock!). Heat can come from many sources, including the geothermal gradient, magmatic intrusions, and the compression of rocks. Recall that minerals are stable at the temperature and pressure that formed the mineral. Since both temperature and pressure change with depth, minerals will change into a new, more stable form as a result. Confining pressure occurs when pressure is equal in all directions. This typically occurs during the burial of sediments. Differential stress occurs due to unequal pressure in different directions. An example of this would be compression. Imagine squeezing a ball of dough between your hands. The force exerted by your hands (in the horizontal direction) is greater than the force in the vertical direction. Deformation is a general term that refers to all changes in the original form and/or size of a rock body. There are two types of deformation: brittle and ductile. 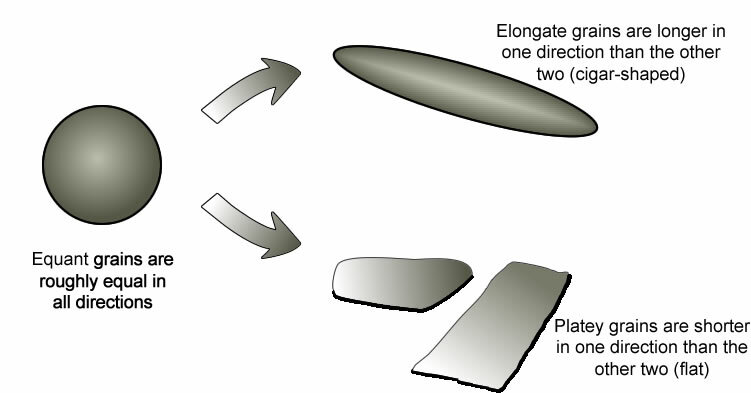 An example of brittle deformation would be dropping a plate; the result would be the shattering of the plate. Ductile deformation would occur if a ball of dough were to be dropped; instead of shattering, the dough would just flatten against the ground. Compression - two sides are squeezed towards the middle. Stress is therefore greater in one direction than in the others. Example: reverse faulting, continent-continent collisions. Tension - two sides are pulled away from the center. Stress is therefore greater in one direction than in the others. Example: normal faulting, diverent plate boundaries. Shear - the top is pulled in one direction, while the bottom is pulled in an different, usually opposite, direction. Strike-slip faulting is an example. Strain refers to the change in shape due to deformation. Types of strain include stretching, shortening, and shear. The result? Rocks can be relocated from one location to a new one, or they can be tilted at some angle. They can also change shape via folding and faulting. the temperature of the rock or surrounding area - the higher the temperature, the more deformation will occur. the amount of pressure - the higher the pressure, the more deformation will occur. the rock type (composition) - some rocks just deform better than others. the rate of deformation - is the rate fast? Slow? Deformation that occurs at a slow rate tends to be more intense. and time - the longer the forces have to act upon the rock, the more intense the deformation will be. At higher temperatures and pressures, differential stress deforms rock, and the rocks change shape slowly without breaking. Deformation acts on minerals with specific shapes. Many mineral grains start out as equant, or roughly equal in all directions. Deformation can cause the grain to change shape. Elongated grains are longer in one direction than in the other two, causing the grain to look cigar-shaped. Platey grains are shorter in one direction that the other two, forming a flat, 'pancake' like shape. The result is that the grains will not only change shape due to stress but will reorient themselves as well. Grains will rotate and become parallel with one another to better cope with the stress. This preferred platy mineral alignment is called foliation. Foliation is NOT layering or bedding! Layers or beds develop in sedimentary rocks during deposition. Foliation is a texture that develops as a result of stress on the rock which reorients the minerals such that their long axis is perpendicular to the direction of pressure. Metamorphism can occur due to hot water with other volatile components. Hydrothermal alteration is called metasomatism.